This year at the Canadian Historical Association Annual Meeting, we recorded ten episodes of the History Slam. I am extremely grateful to the CHA and the Department of History at the University of Ottawa for help in getting everything done. It was a lot – I spent the majority of the Tuesday in a meeting room recording episodes – but it was also a lot of fun. Perhaps the only downside is that we had to hold an episode for nearly six months before it could be posted. The episode that finally gets to emerge today is one on a topic that I’ve always enjoyed: religion. 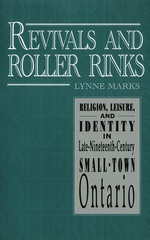 During my comprehensive exams, one of my favourite books was Revivals and Roller Rinks by Lynne Marks of the University of Victoria. I really enjoyed the way she examined people’s leisure time and its connection to religious participation. As we talk about in the episode, it’s difficult to study the depth of a person’s belief in a particular deity, but we can examine their participation in a church and how they self-identified in census records. With the great variety in motivations for joining a religious organization, there is so much to unpack when studying the history of religion. In this episode of the History Slam, I talk with Lynne Marks about her research on religion. We chat about the differences between Ontario and British Columbia, the extent to which belief alters religious participation, and the challenges of studying such a topic that is so personal for so many people.